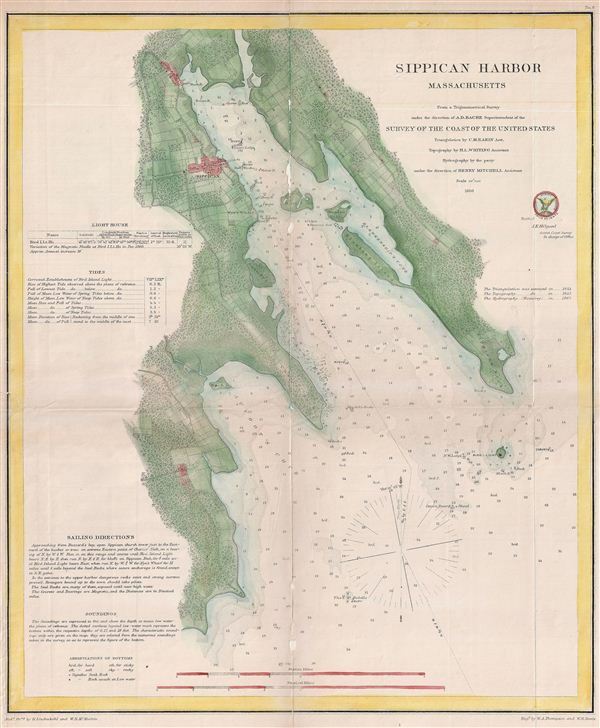 An uncommon 1855 map of Marion or Sippican Harbor, Massachusetts. Located on the western side of Buzzards Bay, Sippican or Marion is a small bay historically known for its many resident sailors and sea captains. Today it is a popular tourist destination. Details they bay as well as the sounding countryside, fields, and the town of Sippican or Marion (renamed in 1852 after the Revolutionary War Hero Francis Marion). The map features numerous depth soundings and excellent inland topographical detail. A note in the lower left quadrant offers sailing instructions and notes on soundings. Drawn on a scale of 1:20,000. The triangulation for this chart was the work of C. M. eakin. The Topography was accomplished by H. I. Whiting. The hydrography was completed by a party under the command of Henry Mitchell. The whole was compiled under the exacting direction of A. D. Bache, Superintendent of the United States Coast Survey from 1843 to 1865. Report of the Superintendent of the United States Coast Survey, Washington, 1866. Good. Some centerfold repair and toning. Blank on verso.